Cedar Row Farm is a family farm that was founded in 1916 on 160 acres in Columbia County along the Nehalem River just east of Birkenfeld, Oregon by Ellen and Joseph Lonnquist. Ellen grew up a mile down the road on a farm that her parents, immigrants from Denmark, homesteaded. Cedar Row Farm was inherited by Ellen and Joseph's grandchildren in 1988. It is nestled in the Nehalem River Valley and hosts a rich collection of native Oregon plants, birds, and wildlife. There are 120 acres of timber in various stages of growth, 20 acres of grass hay, and 20 acres in riparian area and Conservation Restoration Enhancement Program reserve. 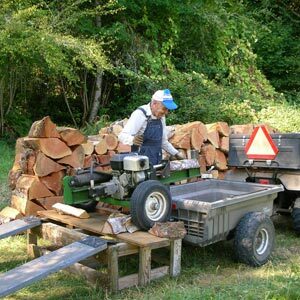 The wood that you are purchasing is taken off our farm as part of our forest management. We believe that a diverse forest is a healthy forest, and keep a mixed species forest as part of our management plan. Our forest is Forest Stewardship Council (FSC) Certified.